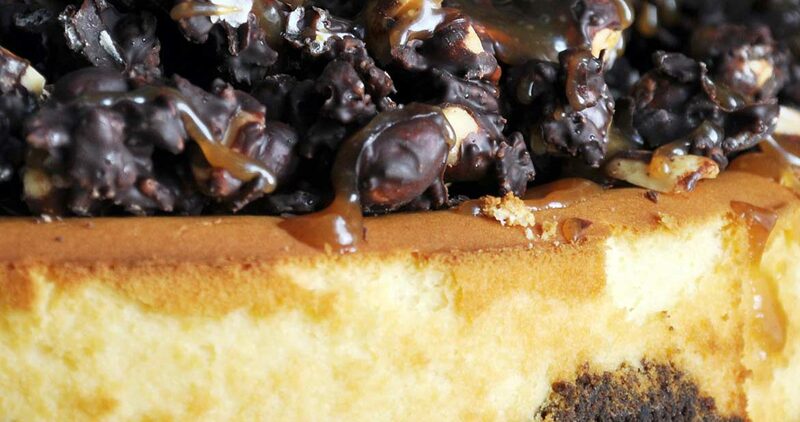 THE Cheesecake for Chocolate Peanut Butter Lovers. 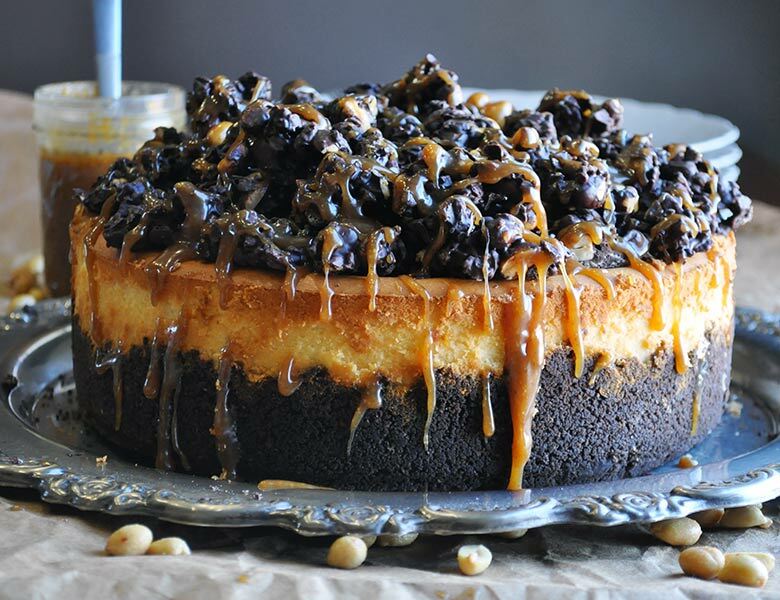 Peanut Butter Cheesecake. Those three little words are enough for me to start drooling. Add a chocolate cookie crust, a towering layer of chocolate peanut butter crunch topping and a drizzle of peanut butter sauce and I am in heaven. Chocolate and peanut butter is one of my absolute favorite flavor combinations. It’s one of those combinations I have a hard time not overdoing. Wherever there’s chocolate, it seems like peanuts should follow. And vice versa. Most of the time, I simply don’t have enough restraint to leave chocolate out when peanut butter is involved. For example, these Peanut Butter Oatmeal Chocolate Chip Cookies started out as simply peanut butter oatmeal cookies and ended up including chocolate chips. I don’t know if I’m capable of eating vanilla ice cream without a sprinkle of salty peanuts and a drizzle of hot fudge. Well… I’m sure I’m capable of it. But, why would I want to? I come by my chocolate peanut butter obsession honestly. If anyone loves the chocolate and peanut butter combination more than me, it’s my mother. For years, her favorite Dairy Queen treat was the Peanut Buster Parfait. That is, until they introduced the Snickers Blizzard, which took it’s place. Also, growing up, my mom made the most amazing Chocolate Peanut Butter Bars. As an adult, I found myself making them so often that I had to create a healthier version of the recipe. So, this is the point in which I feel I should say that, if you are looking for a healthy way to eat chocolate and peanut butter, you should go make the healthy version of the afore mentioned Chocolate Peanut Butter Bars. If you are looking for pure indulgence and over-the-top decadence, this Peanut Butter Cheesecake gets the job done. And then some. I’m blaming my parents for the fact that there is currently a peanut butter cheesecake in our refrigerator. This past Christmas, I made several different ice cream toppings and packaged them up with these gorgeous ice cream dishes as gifts for our parents. Seriously. 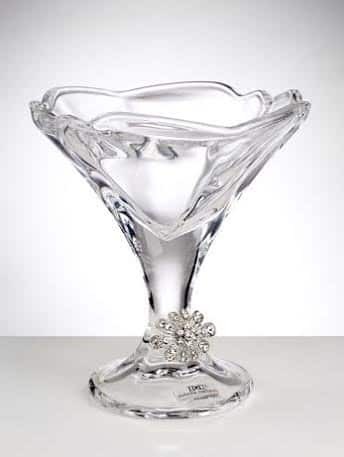 Who wouldn’t want to eat ice cream out of a Swarovski Crystal Dish? Included with the ice cream dishes were jars of hot fudge with a dash of peppermint extract, butterscotch sauce, malted hot fudge sauce, caramel rum sauce and peanut butter sauce. Of course, I made enough of each for the people living in my house to have some too. But, I got a bit carried away with the peanut butter sauce. So, weeks after Christmas, we still have a big jar of peanut butter sauce in the refrigerator. Well, we had a big jar of peanut butter sauce in the refrigerator. Now, we have a peanut butter cheesecake in there. 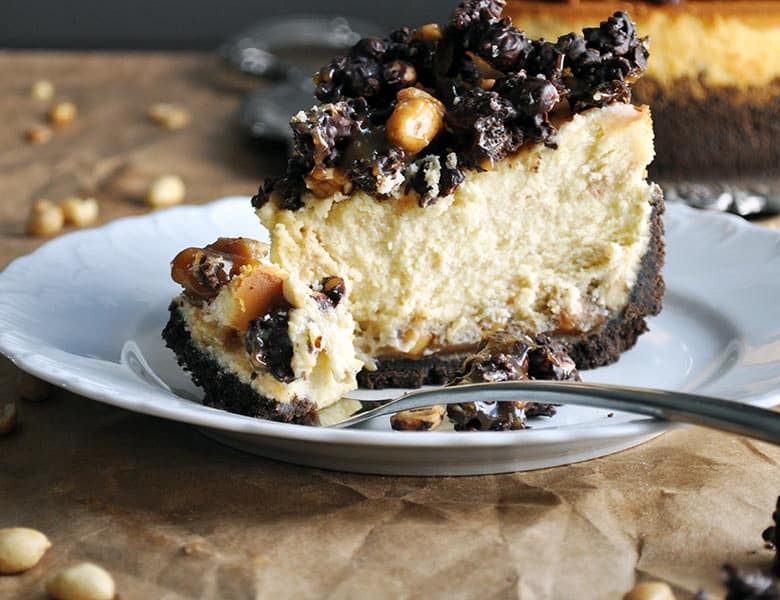 As with most good things in life, this peanut butter cheesecake requires a bit of planning ahead. Make the peanut butter sauce at least 2 days ahead of time. Also, make enough peanut butter sauce that you have some left over. It will last in your refrigerator for weeks and is absolutely amazing over vanilla ice cream. Also, it’s important that you allow this peanut butter cheesecake at least 12 hours to chill in the refrigerator before serving. So, make it the day before you want to serve it and put it in the refrigerator overnight. The chocolate crunch topping only takes an hour or so to firm up in the refrigerator, so you can make it the same day you bake the cheesecake, or make it an hour or two before you plan to serve the cheesecake. Your choice. This recipe makes a LOT of cheesecake. 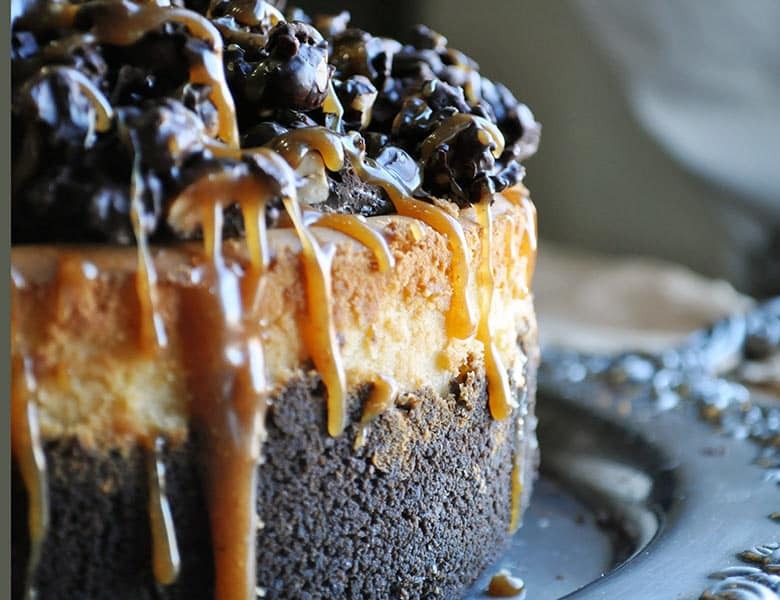 If you love cheesecake, than you’ll also love this Marble Chocolate Cheesecake. 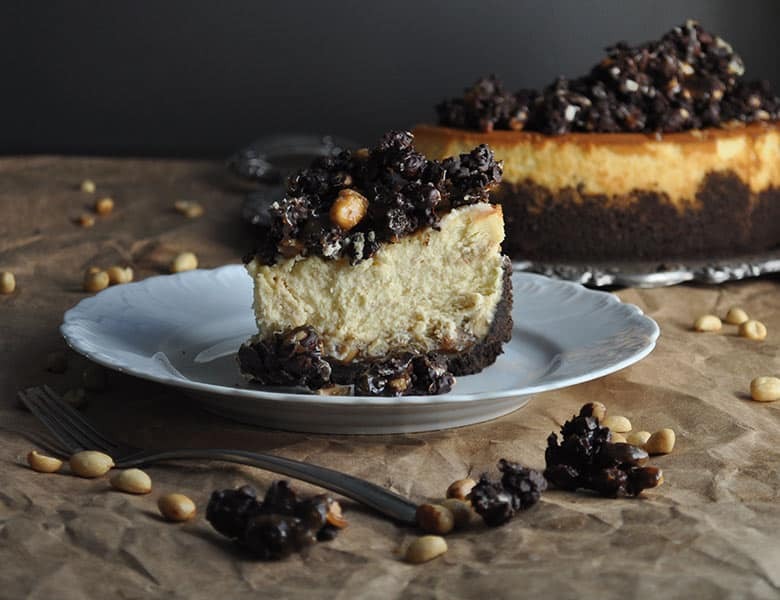 Peanut Butter Cheesecake with a chocolate cookie crust, a towering layer of chocolate peanut butter crunch topping and a drizzle of peanut butter sauce. Fit the bottom of a 10 inch springform pan with a round of parchment paper cut to fit. Finely crush the chocolate graham crackers in a food processor. Alternatively, you can put the graham crackers in a ziplock bag and crush with a rolling pin. Pour the crumbs into a medium size bowl, and add the melted butter and salt. Mix with your hands until all the crumbs are moistened. Press the mixture into the bottom and about half-way up the sides of a 10-inch springform pan. Beat the cream cheese, sugar, flour and salt with an electric mixer on medium speed until creamy and smooth, about 2 minutes. Scrape down the sides of the bowl. Add the eggs and egg yolks and beat on low speed until well combined, about 2 minutes more. Add the whipping cream and vanilla and mix on low just until combined. Pour the cheesecake batter into the prepared cookie crust. Drizzle 1 3/4 cups of the peanut butter sauce over the top of the batter and gently swirl it into the batter with a knife. Place the pan on a baking sheet and bake for 20 minutes. Reduce the oven temperature to 200 degrees and bake for 90 – 120 minutes. To know if the cheesecake is done, gently shake the pan. The center of the cake should move a bit, but seem more solid than Jello.The outside of the cake should not move at all. Turn off the oven and leave the cheesecake in the oven with the door closed for 30 minutes. Remove the cheesecake from the oven and let cool completely on a wire rack. Cover and refrigerate for at least 12 hours. Make a double boiler by filling a saucepan 3/4 full of water and bringing it to a boil. Fit a heat proof bowl over the boiling water – the bowl should fit snuggly over the saucepan so just the bottom of the bowl is touching the water. Dump the chocolate chips into the bowl and let them sit without stirring until they are about 2/3 melted. Remove the bowl from the heat and stir until the chocolate is completely melted. Stir in the Rice Krispies and peanuts and spread out into a thin layer on the parchment covered baking sheet. Let cool in the refrigerator until the chocolate is hard. Remove the side of the springform pan from the cheesecake. Use a spatula to lift the cheesecake off the bottom of the springform pan onto a serving platter. 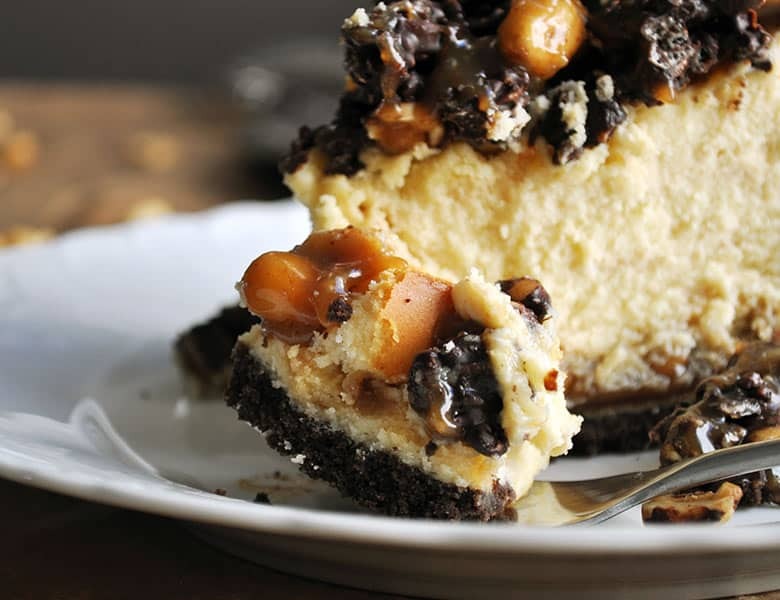 Break the chocolate crunch topping into pieces and pile on top of the cheesecake. 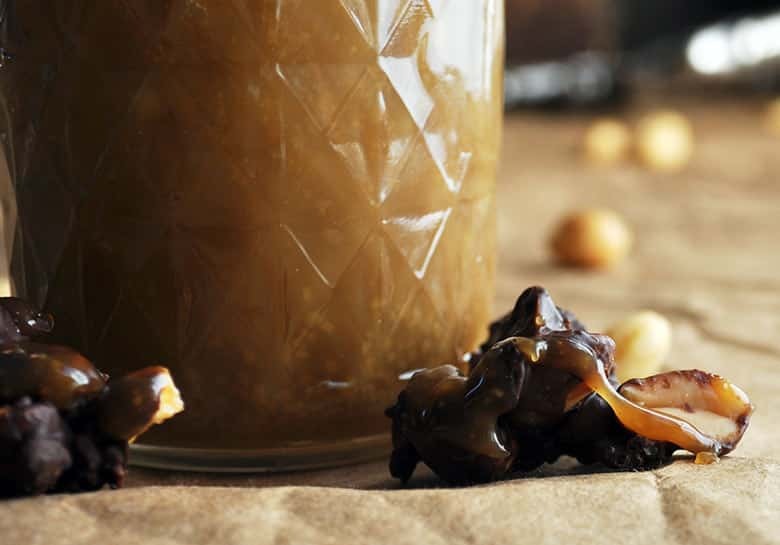 Warm the remaining 1/4 peanut butter sauce slightly – about 20 seconds in the microwave – and drizzle the sauce all over the top of the chocolate crunch topping. Serve. The cheesecake will keep covered in the refrigerator for up to 4 days. 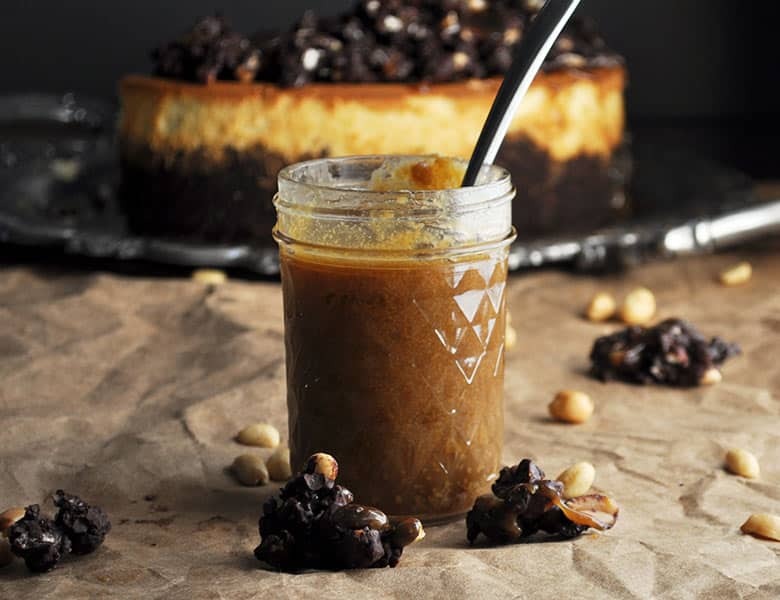 This rich peanut butter sauce is delicious over vanilla or chocolate ice cream, or swirled into peanut butter cheesecake. Add the the brown sugar, butter, corn syrup, and salt to a heavy bottomed medium size saucepan. Cook over medium heat, stirring often, until the sugar is melted and the mixture begins to boil. Turn the heat down to low and stir in the peanut butter. Stir until the peanut butter is complete incorporated into the sauce. Pour in the cream and stir constantly until the cream is completely incorporated into the sauce. Remove from the heat and stir in the vanilla and peanuts. Pour the sauce into jars, or another covered container, and store in the refrigerator. Wow this is a master piece. looks absolutely divine! Thanks Lucy! Based on how quickly this disappeared from our refrigerator, I’d say it was a hit! I hope you try it! 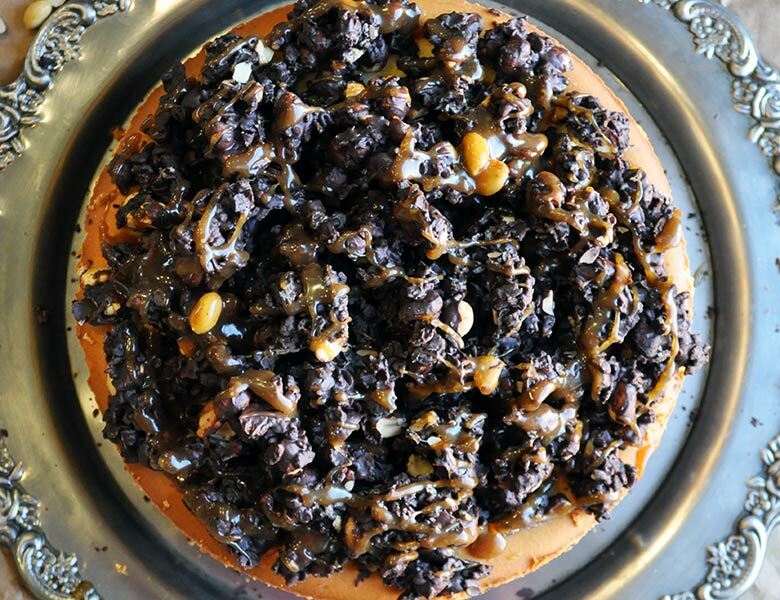 Wow, what a beautiful peanut butter chocolate cake! I almost feel bad for diving in and eating it all… almost though… time to bake one myself! Thanks or sharing! I made this recipe today and I have a question about the caramel sauce. 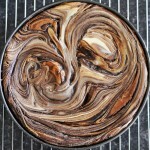 It calls for 1 3/4 cup to be swirled on top before it is baked. It felt like alot of caramel and I wasn’t sure just how much to swirl it in. So it began to brown very fast on the top. I ended up placing foil on the top so that it wouldn’t get to dark. Let’s just say it isn’t as light in color or as pretty as yours. Help? Ideas? Hi Dana! My guess is that you needed to swirl the peanut butter sauce into the cheesecake batter a bit more so that less of it was sitting on top. Was the majority of the sauce on top of the cheesecake? The other thing that might be happening is that the cake was too close to the top of your oven. Could that be a possibility? By the way – I really appreciate your taking the time to reach out and ask me this question. If this happened to you, it’s likely to happen to someone else, so understanding what happened will help me go back and add further clarity in the recipe instructions. Laying foil across the top was the right move if it was browning too much, though! Did you leave the foil over the top of the cake even after lowering the temperature after the first 20 minutes of baking. How did the cheesecake taste? I wasnt sure just how much to swirl it in. So yes I believe I needed to incorporate the caramel sauce more than I did. I feel like that is exactly why the caramel scorched prematurely. I did leave the foil on the whole time except the last 30 mins so that the middle would firm up. My racks were fine but I did have my oven fan on so I probably had it too hot as well. See..
.learning all the way around! I haven’t tasted it yet as it needed to cool 12 hours. I will post a picture and a taste as soon as I get home from work.